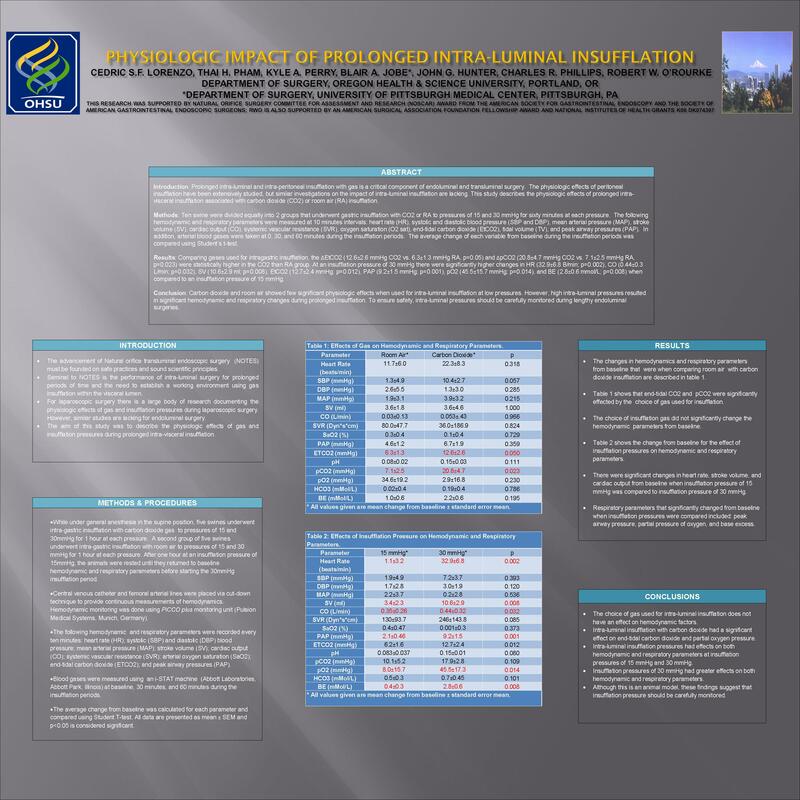 PHYSIOLOGIC IMPACT OF PROLONGED INTRA-LUMINAL INSUFFLATION. Cedric S.F. Lorenzo MD, Thai H. Pham MD, Kyle A. Perry MD, Blair A. Jobe MD, John G. Hunter MD, Charles R. Phillips MD, Robert O’Rourke MD. Department of Surgery; Oregon Health and Science University, Portland, OR. Introduction: Prolonged intra-luminal and intra-peritoneal insufflation with gas is a critical component of endoluminal and transluminal surgery. The physiologic effects of peritoneal insufflation have been extensively studied, but similar investigations on the impact of intra-luminal insufflation are lacking. This study describes the physiologic effects of prolonged intra-visceral insufflation associated with carbon dioxide (CO2) or room air (RA) insufflation. Methods: Ten swine were divided equally into 2 groups that underwent gastric insufflation with CO2 or RA to pressures of 15 and 30 mmHg for sixty minutes at each pressure. The following hemodynamic and respiratory parameters were measured at 10 minutes intervals: heart rate (HR), systolic and diastolic blood pressure (SBP and DBP), mean arterial pressure (MAP), stroke volume (SV), cardiac output (CO), systemic vascular resistance (SVR), oxygen saturation (O2 sat), end-tidal carbon dioxide (EtCO2), tidal volume (TV), and peak airway pressures (PAP). In addition, arterial blood gases were taken at 0, 30, and 60 minutes during the insufflation periods. The average change of each variable from baseline during the insufflation periods was compared using Student’s t-test. Results: Comparing gases used for intragastric insufflation, the EtCO2 (12.6±8.2 mmHg CO2 vs. 6.3±4.1 mmHg RA, p=0.05) and pCO2 (20.8±4.1 mmHg CO2 vs. 7.1±7.9 mmHg RA, p=0.023) were statistically higher in the CO2 than RA group. At an insufflation pressure of 30 mmHg there were significantly higher changes in HR (32.9±21.4 BP/min; p=0.002), CO (0.44±1.0 L/min; p=0.032), SV (10.6±9.2 ml; p=0.008), EtCO2 (12.7±7.6 mmHg; p=0.012), PAP (9.2±4.6 mmHg; p=0.001), pO2 (45.5±54.7mmHg; p=0.014), and BE (2.8±2.0 mmol/L; p=0.008) when compared to an insufflation pressure of 15 mmHg. Conclusion: Carbon dioxide and room air showed few significant physiologic effects when used for intra-luminal insufflation at low pressures. However, high intra-luminal pressures resulted in significant hemodynamic and respiratory changes during prolonged insufflation. To ensure safety, intra-luminal pressures should be carefully monitored during lengthy endoluminal surgeries.